Shop around and you might find a 48-hour or longer rental—and even pay less than for 24 hours. After my wife and I had our first kid, we realized part of our younger days were gone forever: we could no longer reliably watch even a 90-minute movie in a single evening. We were too exhausted, or our baby (then babies) needed us. Our older child was born when Blockbuster still existed and Redbox didn’t, and late fees were a real thing. We even subscribed to Netflix—and had the hole in those silver discs stare at us, wondering why they remained unplayed week after week. Most video services that offer rentals restrict rentals to 30 days from when you purchase and 24 hours from when you press the virtual play button for the first time. But not all services, not all rentals, and not in every situation. Below, I run down each of the services available via a Web browser or an app in iOS—some even in tvOS—and how you can seemingly work around what seems like a universal 24-hour limit—starting by shopping for a better deal. Renting via iTunes is convenient and bypasses HD restrictions, but if you can’t finish a movie within 24 hours of starting it, you’re out of luck. A warning upfront on HD: If you want to view in high resolution from a Mac, every service except for iTunes only allows this on a built-in monitor. That means a laptop or iMac only, and AirPlay won’t work from Macs in most cases, either. 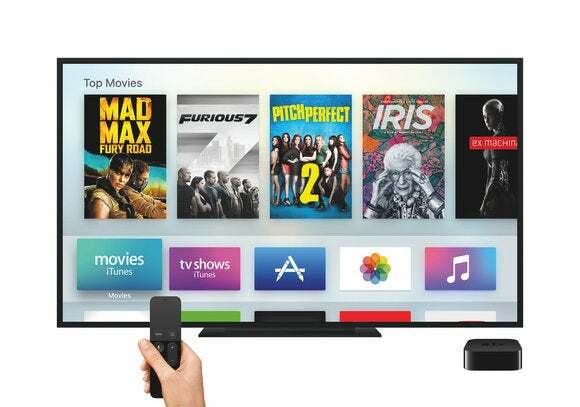 To stream HD or view a temporarily downloaded HD rental movie, you have to use iTunes, an iOS app that allows AirPlay, or a tvOS app (or hardware from other makers, like an Android phone or Roku streaming box). Read my Mac 911 explainer about HD limitations for more. You can often find a 48-hour rental for the price of a 24-hour one. You can sometimes pay a dollar less for a 24-hour rental if you shop around. Only iTunes and YouTube (rented via a browser) have native tvOS apps. Everything else works with tvOS only via AirPlay. While all services listed have iOS apps, not all support AirPlay. And, finally, one tip: If you purchase a rental in error or have trouble streaming a film, contact the service and ask for a refund. Most services offer these readily. I’ve even had Amazon issue an automatic refund when its streaming software detected I was unable to stream the film consistently. Because studios dictate the terms for digital downloads and rentals, you’ll find a surprising amount of common time periods. Most rentals let you start watching within no more than 30 days from the moment of purchase, and most start a 24-hour countdown when you first press play. You can watch the film as many times as you want during that period, and sometimes shift watching among many different devices linked to the same account, but only on one device or in one app at a time. iTunes only offers 24-hour rentals with a 30-day expiration from purchase. (Outside the U.S., it’s 48 hours!) Other services also offer 48-hour or longer periods, depending on the film or studio. What I found with a survey of the same film and new releases is that a single title may be offered with different watching periods across services, often for a slightly different price. So you can pay $5 for 48 hours at several services, or $5 for 24 hours at iTunes—it doesn’t seem like a hard financial decision. Not all rentals are like that, though, where iTunes has the worst deal. Let’s look at rules and rental periods for all the stores. 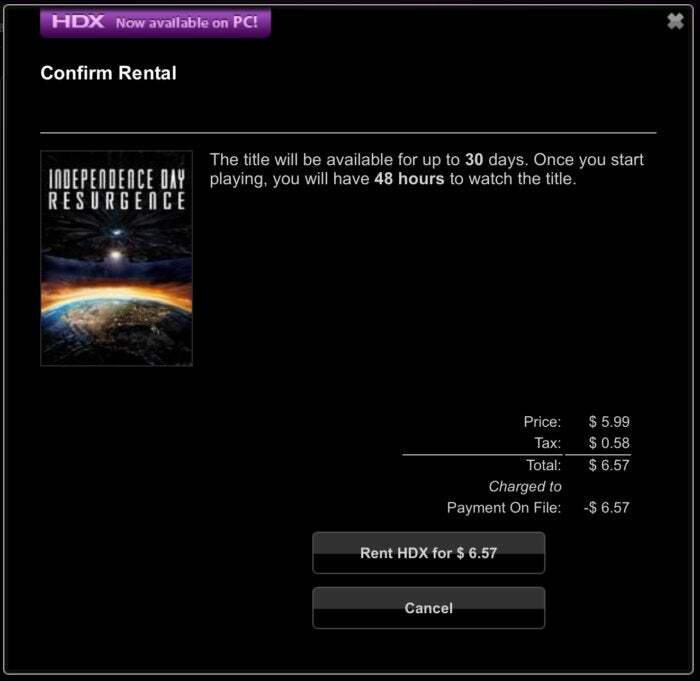 I examine HD rentals for all services; SD rentals are often available for a dollar less, and sometimes even more cheaply. Watch for sales, too, which may require subscribing to mailing lists that frequently update you about offerings. As noted, Apple only offers 24-hour rentals, and you have to start watching with 30 days. However, if you rent a film late enough in the day, and pick up where you left off within 24 hours, you should be able to watch straight through to the end. iTunes lets you continue to watch a movie rental if you restart playback before 24 hours is up and you don’t exit viewing—in other words, you don’t switch to another app in iOS, tvOS, or macOS, or exit the viewer. This isn’t mentioned in Apple’s FAQ, but I’ve seen this behavior, and confirmed with some colleagues that they’d seen it, too. You can rent iTunes movies in the iTunes app on a Mac or PC, in the iTunes Store app on an iPhone or iPad, or in the Movies app on an Apple TV. Since it’s not a documented feature, it could stop working at any time. And people report that if their Mac or other devices crashes, reboots, or they exit playback after 24 hours, the movie expires before they return to the app. How to watch: Via iOS, Apple TV, or iTunes on a Mac or Windows system. Unfortunately, Amazon Video doesn’t offer badging or let you search by rental period. If you search for “48 hours,” you get matches against the movie 48 Hours and its sequels. You have to click through to check on the time offered. Amazon says it often has 24-hour rental periods, but you can easily find films that rent for 24 hours elsewhere and 48 hours on Amazon. I looked at newly released films, figuring those would be more likely to offer a 24-hour rental period, and it was all over the map. A deeper examination by studio might reveal a pattern. Independence Day: Resurgence and Star Trek Beyond give you 48 hours to watch, while you have to finish The Legend of Tarzan and Bad Moms within 24 hours. Older films may give you more time, too. The 1995 version of Judge Dredd offers a 72-hour rental period for $4 in HD. Some films have more oddball rental periods, typically independent studio releases. Being George Clooney, a documentary about international audio dubbing of movies, offers seven days to watch from the moment of purchase, for $5 in HD. One hack that works modestly well is to search Google with site:amazon.com video “48 hours to finish”, which will return a few items you don’t want at the top, followed by an arbitrary set of possibly popular films. 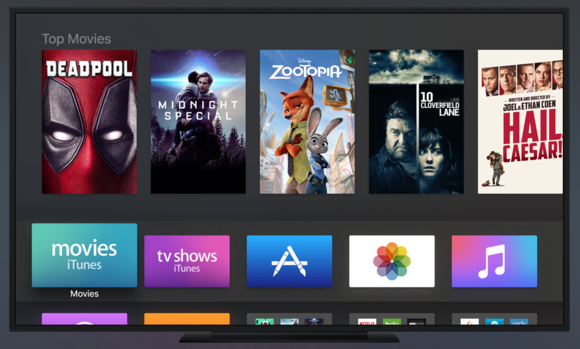 How to watch: There’s no Amazon Video app for tvOS, but you can watch in almost every other way: via a Web browser, through an iOS (plus AirPlay) or other smartphone or tablet OS app, via a Fire TV, and more. A less well-known service, CinemaNow has a seemingly large catalog, although it seems to present oddball selections in its main browsing list. While it offers both 24-hour and 48-hour rentals, depending on the film, I only found 48-hour rentals available in my check of a few dozen titles. CinemaNow tends to have longer rental windows than Amazon and iTunes. That was even true for the two films offered at Amazon Video only for a 24-hour rental, Bad Moms and The Legend of Tarzan. 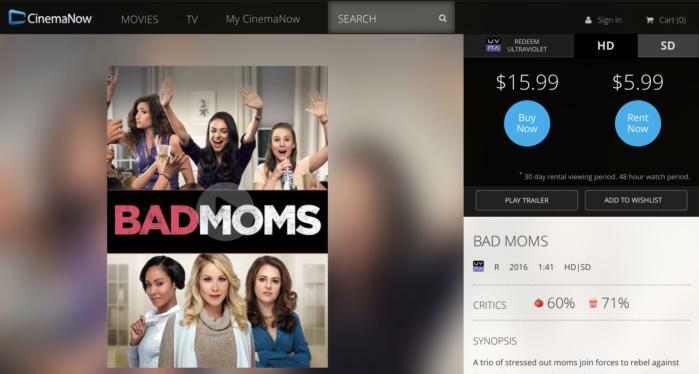 You get twice as long to watch them at CinemaNow, and The Legend of Tarzan is the same price ($5), while Bad Moms is $1 more. It’s clearly worth shopping CinemaNow for films you find elsewhere listed at 24 hours to see if you can get a two-day window to watch. Like Amazon and others, you have to drill down to a detail page to determine the rental period. How to watch: CinemaNow supports practically everything through Web browsers, native embedded support, and native apps, including iOS, macOS, Xbox One and Xbox 360, smart TVs, streaming boxes, and more. Google’s flagship service for applications and media, Google Play, offers a full range of films, and doesn’t state in its support documents any default for rental periods. There’s no way to determine the rental period without viewing a detail page and, in a Web browser, you have to scroll down to Rental Period—most other sites put the duration up at the top of the page. Google Play has good deals, but no native Apple TV app—a big advantage for YouTube. The Legend of Tarzan has a 24-hour rental, just like Amazon, but costs $4 instead of the $5 charged by both Amazon Video and CinemaNow. 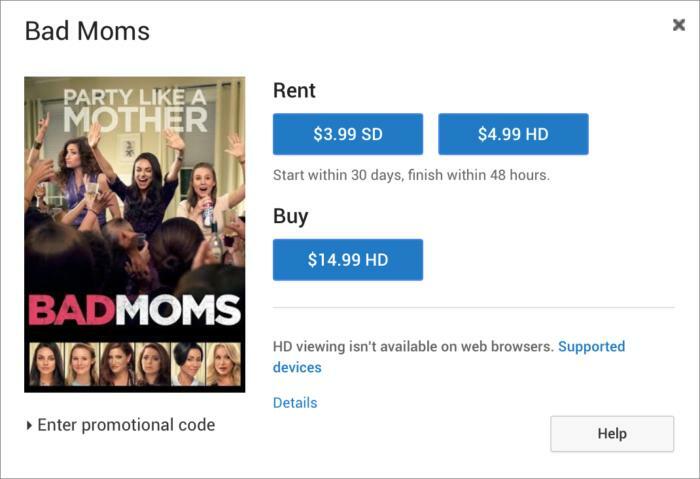 Bad Moms has a longer rental period (at 48 hours) and the same price as Amazon Video. Scanning other films, it seems like this is true for many popular releases: they either cost less or you have longer to watch them at Google Play. How to watch: Like with Amazon, Google lets you watch in a bunch of ways—except via an Apple TV app: via an iOS and Android app, via a Web browser, and through Chromecast, Roku, and LG Smart TV. Vudu has a place in my heart, because years ago it offered on some movies the ability to pay for 24-hour, 48-hour, and 72-hour rentals. Clearly, that didn’t go over big with the studios or customers, and they switched to a single fixed rental period. The site says that only indie films have 48-hour rentals, but I found plenty that offered that longer period as well, including the new Ghostbusters. Vudu doesn’t seem to be cheaper or offer longer rentals, but it has some UHD (4K) rentals and spells out the full cost. Checking films across services, I found a much more mixed bag with Vudu: It often charges more than other services for 24-hour and 48-hour rentals, and has fewer 48-hour rentals available than other sites. Its one nifty feature? It offers UHD (4K) rentals for some movies, though they cost $10 a pop. Other services seem to have few or no 4K rentals, or they change the offerings over time. More 4K rentals should be available everywhere by all accounts. You can’t see the rental period on the movie page, but have to click the rental button to get a pop-up Web dialog that reveals the time offered before you conclude the rental payment. How to watch: Vudu is available for iOS, but note that it doesn’t work with AirPlay, nor is there an Apple TV app—you can only watch rentals on your iOS device. It’s also available for Android, and works with Chromecast. Vudu supports Web streaming, but uniquely among services that can use a browser, not all movies are available for watching on the Web. Read the terms and devices carefully before purchasing. Although Google owns YouTube, YouTube has a movie service that’s separate from the Google Play store. On a spot check, pricing and durations seemed identical between Google Play and YouTube. To determine the length of a rental, you have to click a button that says “From $[price]”; the period is listed beneath the rental price. YouTube uniformly offers the best deal: lowest price or longest rental period or both. It can also stream rentals via its tvOS app. However, YouTube is the only mainstream service to have an Apple TV app! You have to make the rental purchase in a browser, as Google doesn’t support in-app purchases, but you can then access it from the Apple TV app. This seemed too good to be true, so I rented Star Trek Beyond in a browser, switched to tvOS, found the film, and started watching. Although the YouTube app doesn’t show HD and other status on screen, I got up close and it was full 1080p. How to watch: For HD viewing, YouTube can’t use a browser, but requires an app, smart TV, or streaming device. It support iOS, Android, and, miraculously, Apple TV.